This FAQ is an elaboration of a FAQ by Allen McDowell of StataCorp. and Nicholas J. Cox of Durham University. Please see www.stata.com/support/faqs/stat/logit.html for the original. 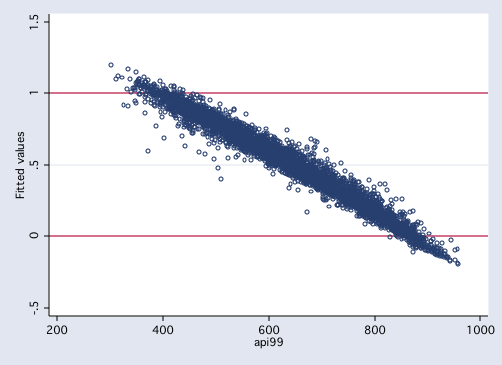 Proportion data has values that fall between zero and one. Naturally, it would be nice to have the predicted values also fall between zero and one. One way to accomplish this is to use a generalized linear model (glm) with a logit link and the binomial family. We will include the robust option in the glm model to obtain robust standard errors which will be particularly useful if we have misspecified the distribution family. 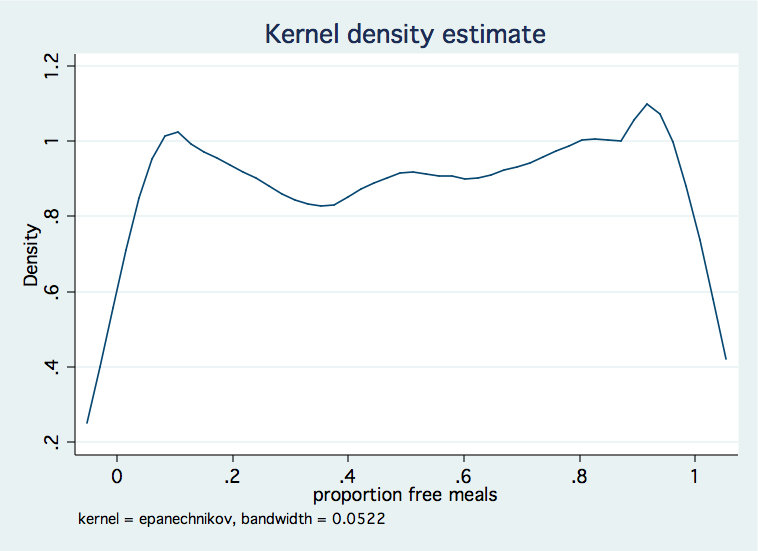 We will demonstrate this using a dataset in which the dependent variable, meals, is the proportion of students receiving free or reduced priced meals at school. Next, we will compute predicted scores from the model and transform them back so that they are scaled the same way as the original proportions. As a contrast, let's run the same analysis without the transformation. 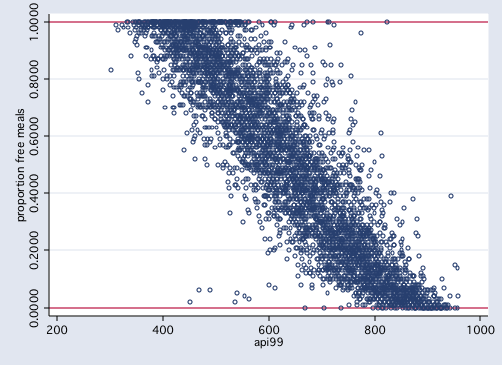 We will then graph the original dependent variable and the two predicted variables against api99. Note that the values from figures 1 and 2 fall within the range of zero to one while those in figure 3 the values go beyond those bounds. 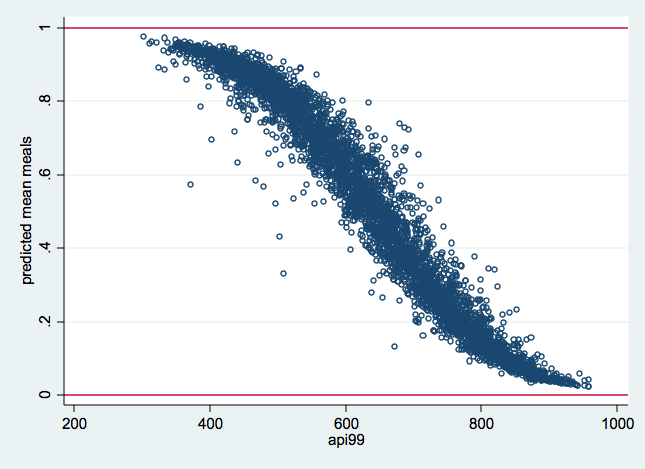 Let's finish by looking a the correlations of the predicted values with the dependent variable, meals. Note that the correlation between meals and premeals1 is slightly higher than for meals and preols. Now, let's say that you want predicted proportions for some specific combinations of your predictor variables. Specifically, for 500, 600 and 700 for api99, for 1 and 2 for yr_rnd, and for parentrd of 2.5. You would append the following six observations to your dataset with an n of 4421. Rerun your model for the 'real' observations (note the in 1/4421), predict for all observations, and display your results.